Machaba Safaris’ Verney’s Camp is in the heart of Hwange National Park in Zimbabwe. Situated on the central side of the southeastern part of Hwange National Park, Verney’s Camp is in a private concession of 10 000 hectares (24,710 acres) which is in a remote part of the park not accessed by other visitors. Open all year. See SEASON HIGHLIGHTS for Zimbabwe. Daily flights from Vic Falls to Manga Airstrip (45 minutes) and a 60-minute game drive to camp. All ages, children under 6 stay free (private vehicle required) and 50% off for children under 12. Machaba Safaris’ Verney’s Camp is in the heart of Hwange National Park in Zimbabwe. Situated on the central side of the southeastern part of Hwange National Park, Verney’s Camp is in a private concession of 10 000 hectares (24,710 acres) which is in a remote part of the park not accessed by other visitors. The camp is located at Verney’s Pan, which is situated on a large open floodplain surrounded by teak forest typical of Hwange National Park. 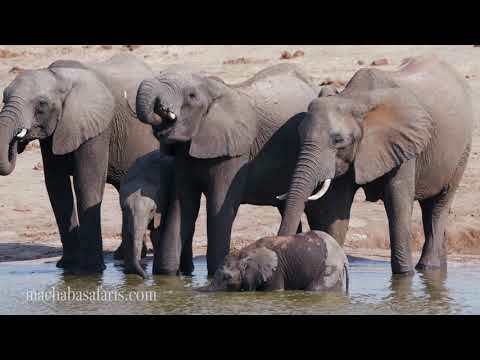 The waterhole at Verney’s plays host to numerous animals and is a playground for the famous elephant herds of Hwange. Verney's Camp welcomes children of all ages and children under 6 years stay free of charge. Please note that a private vehicle must be booked for families travelling with children under 6 years old. Guests can visit Mabale village, where they can meet the chief, visiting a homestead and meeting other locals. The tour includes visits to the 2 schools that Machaba Safaris supports: Main Camp primary school, which is by the National Park's main gate, and the one in Mabale village. There is also a nutritional garden, cattle dip, church and clinic at the village for those who are interested. From Verney’s Camp to Mabale village is about 70km.